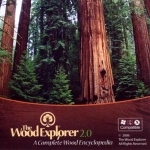 Welcome to The Woodworker's Library Wood and Trees category. The books here largely concentrate on practical uses and/or technical information (density, drying, etc.) for different wood species. However, we also carry books that contemplate the spiritual and visual qualities of the trees that populate our world. Please don't hesitate to contact us if you need any assistance locating the right books for the project you have in mind. IDENTIFYING WOOD: ACCURATE RESULTS WITH SIMPLE TOOLS.